Appendicitis is a sudden inflammation of the appendix. Although the appendix does not seem to serve any purpose, it can become diseased and, if untreated, can burst, causing infection and even death. The cause of appendicitis is usually unknown. Appendicitis may occur after a viral infection in the digestive tract or when the tube connecting the large intestine and appendix is blocked or trapped by stool. 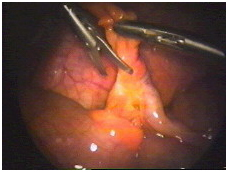 It is thought that blockage of the opening of the appendix into the bowel by a hard, small stool fragment causes inflammation and infection of the appendix (appendicitis). The inflammation can cause infection, a blood clot, or rupture of the appendix. 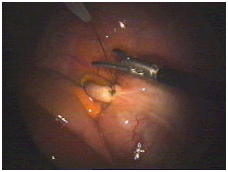 The appendix is then removed using a camera through the belly button as well as two other small incisions. Depending on how advanced the infection is, the patient is kept on antibiotics. If the infection is very advanced, the operation may be delayed while the patient receives antibiotics for several weeks. 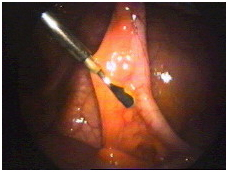 After the infection has improved, a laparoscopic appendectomy is performed. 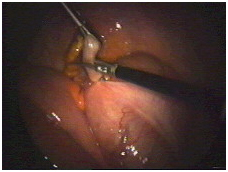 Laparoscopic appendectomy is a safe and effective treatment for appendicitis. However, in the presence of infection, adhesions, or variations in anatomy, this method becomes dangerous and your surgeon may need to make the prudent decision to continue by making the traditional incision to safely complete the operation. This should not be seen as a failure, but as a wise decision by your surgeon to prevent dangerous complications. Other complications, although rare, include bleeding and infection. It is extremely uncommon to require a blood transfusion for this operation. This operation is generally performed with general anesthesia. An IV line will be placed in your arm for fluids and you will be brought into the operation room. The anesthesiologist and nurses will use monitors to check your heart rate and breathing during the procedure. These may include EKG leads, a blood pressure cuff, an oxygen mask and sleeves on your legs to prevent clots from forming. Once you are asleep, the operating room team will work together to perform your operation. When your operation is complete, you will be awakened from anesthesia in the operating room but you may not remember this. After a few hours in the recovery room, the nurses will help you out of bed and give you something to drink. It is common to feel groggy and nauseated soon after surgery and medication is available to help with these discomforts. This information is not intended to replace a visit with your physician. 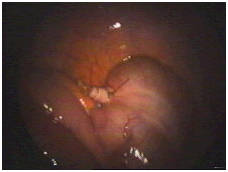 The first step is to free up the appendix down to where it is attached to the large bowel. 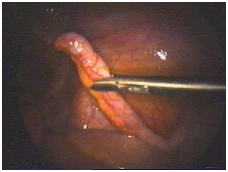 This requires dividing the mesentery which contains the blood vessels that supply the appendix. Bipolar forceps apply an electric current which seals the blood vessels and prevents bleeding. Next, scissors are used to divide the mesentery. 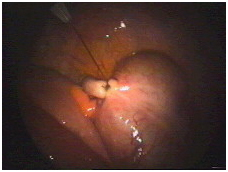 Alternating application of the bipolar forceps and scissors allow complete mobilization of the appendix down to its base. Now the base of the appendix is tied off using a pretied suture which is now being positioned. The suture has now been tightened and appears secure. The knot is a fisherman's knot, which can be tightened, but will not loosen on its own. As shown in this picture, the suture is now cut with the scissors. Finally, the appendix is cut free and is ready to be removed. The operation is complete, and the area is inspected a final time to make sure there is no bleeding.